This is the smaller version of the larger shower Why not relax in this amazing steam shower cabin, enjoy the benefits of steam along with the invigorating back jets it is sure to set the mood for ultimate relaxation. White or Black Glass - You can choose the colour of the Back White, Main image shows White. 3KW Steam Generator - You'll always have plenty of steam produced really quickly. Touch Control Control Pad - Easily control your shower using the latest design of controller. Thermostatic Mixer Shower Valve - Provides anti scald protection. Top Rain Shower - An amazing experience, like standing underneath a waterfall! Handheld Shower Head - Great for washing your hair! Top Lights - These cast a warm glow over you whilst your bathing. 6 Back Massage Jets - Blast the stress away! 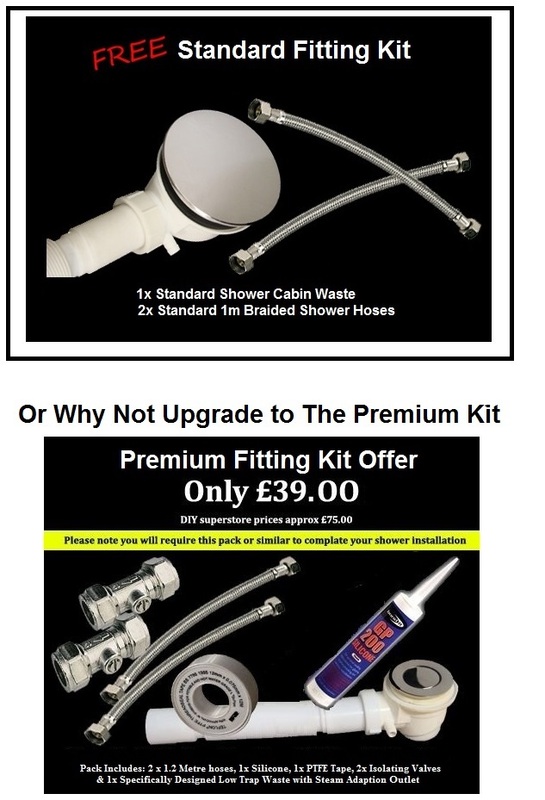 Stainless Stain Support Frames Under ABS Capped Tray - Build Quality to ensure your shower lasts! Extractor Fan - Stops the unit becoming too stuffy during use. Free Specially Adapted Waste Trap Included Saving you over £29.98. Free Thermostatic Valve - allows you to regulate safely the water temperature. Saving you over £28. Optional Water Softener - Little Plumber is a compact, computerised electronic water softener which will descale your existing system, prevent new scale forming and save you money from the moment it is installed. Recommended to enhance the long service life of this unit. 100mm clearance should be allowed for between the cabin roof and ceiling to allow adequate venting. It is essential that a fully qualified electrician and fully qualified plumber install the unit in accordance with current regulations. The product requires hard wiring into the mains.